Karmel offers plain helpful advice suffused with nutritional hints and healthy eating tips that feel more anecdotal than preachy. Tick. Each chapter contains fuss-free, incredibly easy recipes to whip up with variations to suit those with various dietary concerns, allergies or preferences. Tick. Each recipe is simple enough to involve the kids with, with buckets of kid appeal and minimal technique creating sure-fire ways to tempt fussy eaters. Tick. Tick. These dishes are more than doable with basic pantry items – no last minute hurtling to the shops to seek out that elusive, must have ingredient. Big Tick. But best of all, each recipe really works! TICK in capitals. I’ve tried a selection of meals from various chapters, all enthusiastically received by my family. At first, I thought this might be coincidental, perhaps I just chose right recipe, but after working my way through this book, I’m happy to report no failures and ample flavour impact – every single time! In fact, many recipes are now firm family favourites, incorporated into our weekly menu plan. Karmel is not afraid to include high-level flavours and less familiar ingredients into her recipes either, which means every dish packs a full flavoured punch. Well- known family favourites like Pot Roast Chicken sit happily alongside easy Butter Chicken with Yellow Rice. Follow Teriyaki Tuna the next night with Quesadillas with Basil and Mozzarella. Glazed Salmon with Veggie Rice is another winner. They sound deceptively plain but apart from being simple to cook, they are surprisingly delicious and a hundred per cent reliable to reproduce repeatedly. For those not Vegan or Meat-Free, these chapters still invite inspiration and an array of mouth-watering options that are easily modified to satisfy all predilections. Other chapters include lunchbox ideas and celebration holiday cooking treats that invite plenty of kid involvement – you must try the Carrot Cake Balls. All are set out in an easy-to-read, one recipe per page format, many accompanied by divine full colour photography that depicts Karmel cooking in situ with lots of little people. This is one kids’ cookbook that has become a real go-to. 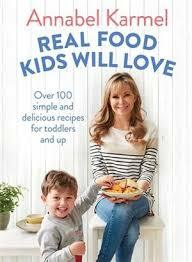 It has extended my recipe repertoire, increased my child’s enjoyment for cooking (perfect for budding junior master chefs!) and best of all kept the campers very happy and full! Highly recommended and well worth the investment in another cookbook this Christmas. Buy your discounted copy, here. Thanks a lot for this book review, I think that you need to make reviews on books in different genres! Hi Kamila, thank you for visiting. Other members of our Boomerang Books reviewing team review books across a wide selection of genres. My passion and expertise lies with Kids’ Lit. Enjoy.